Motorcycling is a fun way to pass a sunny afternoon, but one that requires taking some safety precautions. Motorcyclist deaths have been rising in recent years – more than doubling in 2008 from the record low in 1977. The federal government estimates that per mile traveled, the number of deaths on motorcycles in 2007 was 37 times the number of people in cars. These figures mean it is important to dress to protect yourself in case of motorcycle accidents. Helmets: Helmets are especially important. They are 37 percent effective in preventing motorcycle deaths and 67 percent effective in preventing brain injuries, according to National Highway Traffic Safety Administration (NHTSA) figures. Twenty states and Washington D.C. require all riders to wear motorcycle helmets, including Massachusetts and Vermont. New Hampshire has no motorcycle helmet law. 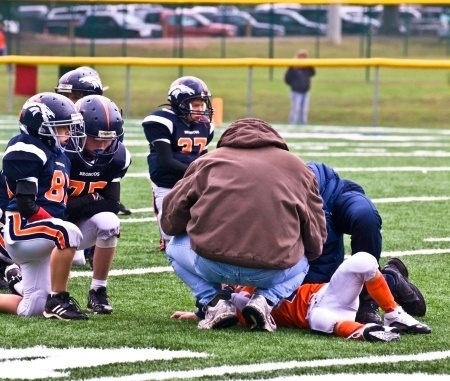 Rhode Island, Maine and Connecticut have laws that require younger operators to wear helmets. If you are looking for a helmet, look for one that meets Department of Transportation (DOT) standards. All adult-sized helmets have been required to meet these standards since 1980. Helmets may be additionally approved by the Snell Memorial Foundation, but this testing standard is voluntary for helmet manufacturers. There are several types of helmets available on the market, but full-face helmets provide the most protection in case of motorcycle accidents. Other types of helmets include open-face helmets and “shorty” half-helmets. If you choose an open-face helmet, make sure to buy a pair of safety eyeglasses. Shorty half-helmets are generally not recommended because they leave a large area of your face and head exposed in motorcycle accidents. Lastly, it’s important to make sure you choose the right size helmet. If a motorcycle dealer isn’t ordering your helmet for you, measure the largest part of your head with a tape measure and call the manufacturer. Most helmets are sold in small, medium, large or extra large, so tell the customer service representative your measurement and ask them what size helmet you need. Clothing: When it comes to jackets and pants, choose the most sturdy materials for the most protection. Leather is considered the best, but denim and corduroy also work. If you worry about overheating, choose pants and vests with zippered vents. And remember, always wear gloves to protect your hands in case of a motorcycle accident or fall on the roadway. Reflective Clothing: The more visible you are to other drivers, the better your chances are for avoiding a motorcycle accident. Wear brightly colored jackets and pants or reflective material that can be seen at all hours day or night. 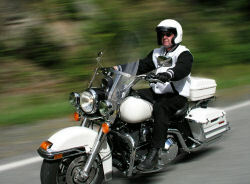 Eye Protection: Many motorcyclists choose helmets with an approved shield covering their eyes. Others use separate safety goggles or shatterproof glasses. Make sure your eye protection is clean and unscratched each time before you start riding. If you use a tinted lens for the bright sun, be prepared. Take a clear lens as well in case your ride goes into the night. Click here for more on state motorcycle helmet laws. Click here for more information about motorcycle helmets and other safety gear from the Motorcycle Safety Foundation.